** FREE POSTAGE within Australia, postage overseas at cost -- Note: Postage will be added automatically when you place an order, but I will adjust the postage cost when the order is processed. 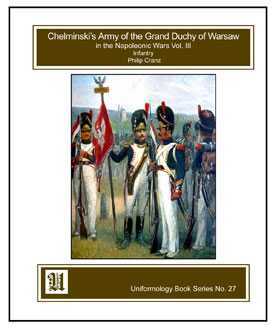 ** This third volume of this series covers the infantry component of the Grand Duchy including that of the famous Danube and Vistula Legions. Polish infantrymen fought in all theatres in which the Grand Armée operated including Spain and Russia. The informative text gives all the details of dress and accoutrements and each plate is accompanied by a brief regimental campaign history. As before, Chelminski provides the paintings and they are further augmented by illustrations and schematics by Leinhart & Humbert. This item was added to our catalog on Monday 19 January, 2009.